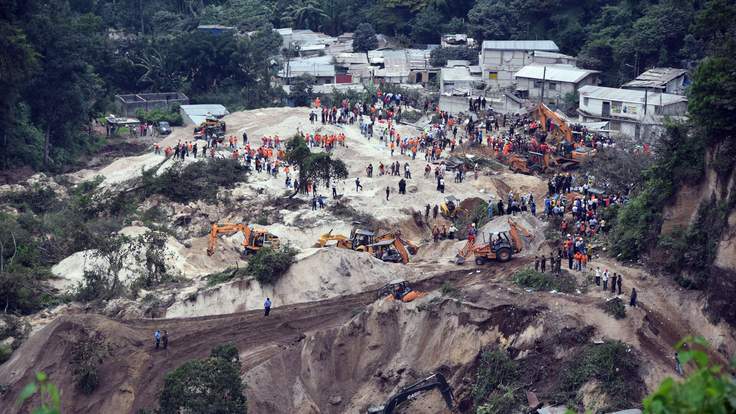 At least 26 people have died and up to 600 people are feared missing after a hillside collapsed on a town in Guatemala, burying more than 100 homes. Aerial video showed the tree-lined hillside laid bare above a huge mound of earth, foliage and debris that completely covered part of the town of Santa Catarina Pinula, 15km east of the capital Guatemala City. The government said 600 rescue workers and volunteers were helping sift the rubble in search of survivors while authorities set up a shelter to help people made homeless. A fire services spokesman said 26 bodies had been recovered so far and the country’s disaster agency said as many as 600 people could be missing. Melina Hidalgo, 35, was washing clothes when the landslide struck. She said there was a loud crash and the lights went out before the houses around her were covered in soil and mud. “I feel like I’ve lost my loved ones because all my neighbours died,” she said.